ArmInfo. Many criticized the Ministry of Health for the fact that citizens, within the social package state employees, were deprived of the right to choose the insurer, but 5- month experience showed that, in fact, all the fears are groundless. 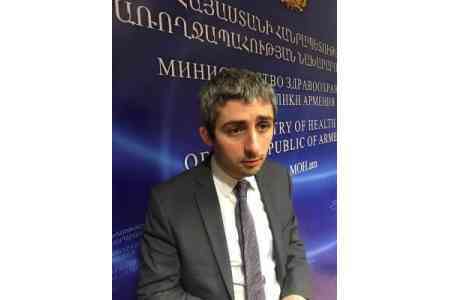 On March 7, at a meeting with journalists, summing up the results of the new procedure for providing medical services within the state package to civil servants, said Deputy Minister of Health of Armenia Samvel Margaryan. As the deputy minister reminded, from October 1, 2017 in Armenia, the beneficiaries of the program need only contact their insurer, present a passport or ID-card. "Today, no other documents or certificates are required, and then the relationship between the insurance company and the medical institution through the electronic system comes into force," he said. What is especially important, civil servants are given the opportunity to choose organizations that provide medical assistance. Through the control mechanisms of the e-health system, the Ministry of Health has reached today that the citizen does not even know which company he serves. At the same time, as the deputy minister emphasized, the former order carried negative elements - the management of the organization could influence the choice of the employee, and the insurance company - to motivate. As a result, at present the social package program for civil servants is distributed among 6 insurance companies in proportion to market coverage, the volume of reimbursements and based on the size of the company's regulatory capital. Criteria, as explained by the expert, are established by the Central Bank and the Ministry of Finance in accordance with modern financial standards. Since 2019, qualitative indicators will also be determining - the number of complaints and the amount of compensation. As for the digital indicators, according to Samvel Margaryan, within 5 months within the framework of the package 42284 state servicemen (out of 98 thousand) were provided medical services in the amount of 1 billion 250 million drams, of which 34942 were Check-up - a comprehensive examination of the body with application of various diagnostic methods.